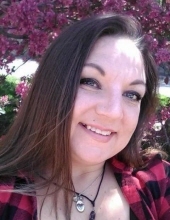 Janet Marie Kilgore Kennemore, 40, of Hannibal passed away at University Hospital on Saturday, January 12, 2019. She was born in Kansas City, Kansas on November 14, 1978, the daughter of the late Gary Kilgore and the late Theresa (Brown) Kilgore. Janet dearly loved her children who survive her passing, Garrett Kilgore (Jessica) of Fort Campbell, Ken., Nathaniel Kennemore of Fulton, Joshua Kennemore of Auxvasse, and Genesis Kennemore of Laddonia. Their father, Robert J. Kennemore Jr., of Auxvasse, also survives. In addition, Janet is also survived by grandparents, Everett and Charlotte Kilgore and Dwight and Shirley Brown, all from Kansas City, Kan.; and many aunts, uncles, and cousins. Along with her parents, Janet was preceded in death by uncle, Steven Kilgore, as well as several other family members. A memorial service will be held at 2:00 p.m. on Tuesday, January 22, 2018 at New Testament Christian Church in Auxvasse with Pastor Toby Hanson officiating. To send flowers or a remembrance gift to the family of Janet Marie Kennemore, please visit our Tribute Store. "Email Address" would like to share the life celebration of Janet Marie Kennemore. Click on the "link" to go to share a favorite memory or leave a condolence message for the family.